With DK out of town, I inserted myself into Bensley's planed ride of catching the Hell Ride to Mt Eliza, then roll on to Arthurs Seat. The Hell Ride was interesting, mostly because of the sheer police presence, if I recall correctly, it was 4 cars and 3 motorbikes. 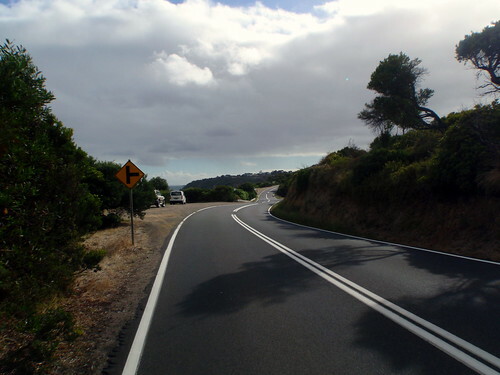 They chatted to the bunch before we rolled out of Black Rock, they stopped it around Mentone to do a helmet compliance check, and followed it not just to Patto, but to Mt Eliza, and I'm told all the way back round to Black Rock. 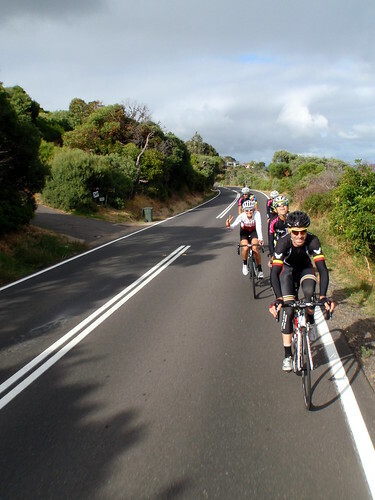 After Mentone, we basically just rolled a steady paceline through to Frankston, where it got strung out a bit by the hills. It felt like racing a handicap, especially as Timmy McGrath kept asking how far it was to Ballarat. Cheeky bugger! Anyway, 6 of us rolled on to Arthurs Seat, for what turned out to be a pretty nice day. I even set a new PB up the climb, which came as a fair surprise to me, as my legs felt a bit off. Aimz Bradley pointed out that it was likely just cafe legs, as we'd stopped in Dromana for a coffee before heading up the hill. It may have also been to do with Chris and Adz surging the whole way up. Chris seemed to take great pleasure in punching it out of the early hairpins, looking back to see if he'd dislodged either Adam or myself. I say took pleasure on the early hairpins, because he successfully dislodged me, and I have no idea what they did towards the top. 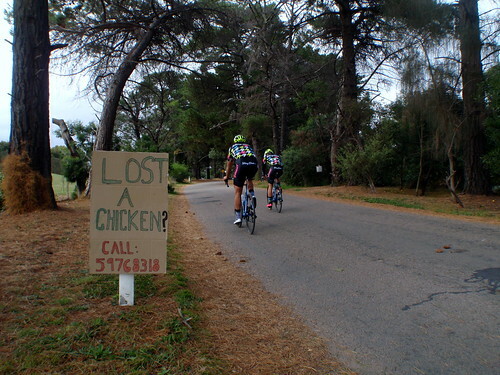 As an aside, if you lost a chicken near Mornington, you should call (+61) 3 5976 8318. "they stopped it around Mentone to do a helmet compliance check", how does this work for those who sweat like a fat man eating chilli dogs and that sweat has worn off the numbers on the stickers? how was that handled on helmets not just out of the box to show the numbers. Hope all is well Big Neil. dunno muz, most of the officers were slightly apologetic about their presence. for my part, I took off my lid, aimed the underside at the fellow, and rode on when he nodded his head.